Well they’re not moon shoes, but a new device called the iShoe developed by an MIT graduate student may have your grandmother channeling her inner astronaut. 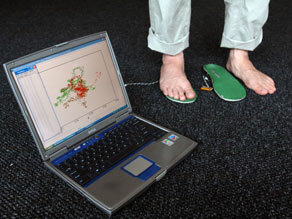 Lieberman demonstrates how sensors on the iShoe insole can diagnose balance problems. That’s because Erez Lieberman and researchers at the Harvard-MIT Division of Health Sciences and Technology are designing new sensory insoles that may soon help doctors diagnose balance problems in senior citizens before major falls occur. It’s based on a technology astronauts now use every time they return to earth, and one that Lieberman himself helped develop while an intern at NASA. Lieberman and the iShoe team are now testing a new version of the technology; one that can help the elderly by analyzing pressure distribution on their feet. With more than 250,000 Americans breaking their hips each year during major falls and 1-in-4 dying within a year of their injury, the device would be a welcome help to doctors, patients, and their families. In fact, it was his grandmother’s death after a fall that first inspired Lieberman to apply the NASA technology to senior citizens. In the future, Lieberman hopes that iShoe will be equipped with technology that would help correct a patient’s balance issue as it occurs. It could even sound an alert when a fall occurs. “Eventually we hope to provide subtle auditory and vibrational cues which will help the person adjust their balance. These cues will help them stand up straight and walk around confidently,” Lieberman says. The iShoe team expects their product to be on the market with in two years. Say it ain't so! Our "wasteful" space program can't possibly have any benefits for people here on earth. And with all the baby boomers going geriatric, this could really help A LOT! Sorry for the sarcastic tone, but I am still dumbfounded by how negative people are about the fact that we even spend a dime on the space program, yet we get things that can actually improve their quality of life. They must live in such a dull and uninspiring world! Again, American healthcare's super abundant funds are at work here on a great project. Actually, Taichi could be more helpful to seniors than iShoes. But the trouble is Taichi does not need funding! iTaichi? No way! Taichi, Kung Foo Grandma,versus Wing Chun Panda. Pandas are nearly extinct, this could be the tipping point. how do you get everyone to look so hot teoethgr? your images are always sultry and stunning!the last one should be blown big and put somewhere like times square.